Big news for the Dynamics community! Microsoft just announced the Dynamics 365 Spring 2018 release, and it comes with many major changes. The full Spring release notes can be downloaded here. Be warned: this document is over 200 pages long. It’s worth a read, but if you’d like a summary of the main changes and links to additional documentation or readiness resources, keep on reading this article! 1 – Adjusting the Dynamics 365 applications so that they will work together better across all business processes. Rather than a combination of separate applications, Dynamics 365 will become a unified group of solutions which can support all business activities. 2 – Improving Dynamics 365 integrations with other Microsoft products. 3 – Bringing new platform capabilities: the Business Application Platform will make it easier to create and customise new applications using Dynamics 365, Office 365, PowerApps, Microsoft Flow and Power BI. GDPR: the Dynamics 365 Spring release includes changes designed to ensure the compliance of Dynamics 365 with the requirements of GDPR. We will soon publish a different blog article about GDPR and its impact on Microsoft Dynamics. General availability of Dynamics 365 for Marketing: a new application focused on building relationships with prospects more effectively and to provide more automation for marketing processes. Dynamics 365 for Sales: a new version of the Dynamics Sales application takes Sales Force Automation a step further. Artificial intelligence: new artificial intelligence capabilities have been included to this new Dynamics 365 release. New Power BI apps will be available for preview: Power BI for Sales Insights and Power BI for Service Insights. The Common Data Service for Apps will be updated – see the announcement for the PowerApps Spring Update. The Common Data Service for Analytics will be added to Power BI. 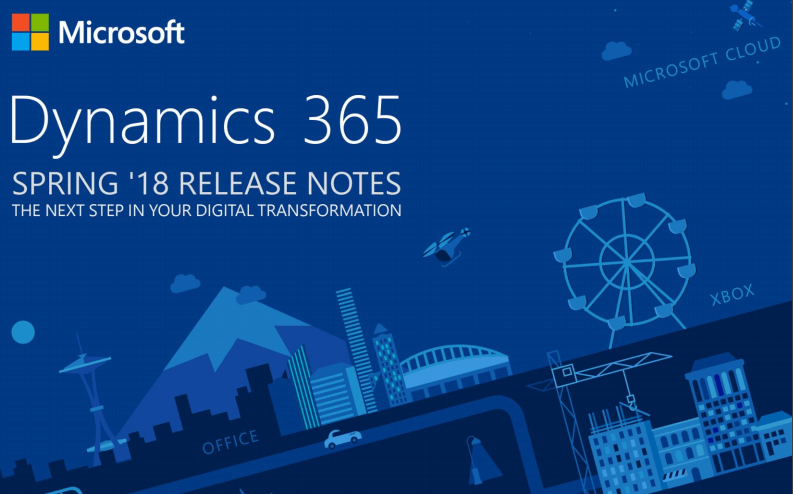 For a summary of the spirit of the new release, read the Dynamics 365 Spring 2018 release notes announcement on the Microsoft blog. If you’d like a deeper (and more practical) dive into the functionalities of this Spring release, read Accelerating digital transformation with the spring 2018 release for Dynamics 365 and Business Application Platform by Microsoft Corporate Vice President James Philips. The Microsoft Dynamics 365 Roadmap page is also a great place to go for details about each of the new Dynamics 365 capabilities. This new release is a focal point of the Microsoft Business Forward event in Amsterdam. We highly recommend keeping an eye on the Microsoft Business Forward page for links to blog articles, videos, webinars and resources related to the Dynamics 365 Spring update. Webcast: Microsoft is holding a Business Applications virtual spring launch event on March 28th( 8:00 am PST 11:00am EST). Register now if you don’t want to miss it!